← Oh, the Folly of Slackers! Life’s burdens weighed heavy. Snowy flecks drifted to and fro from soft, gray clouds. Through the window’s frosty pane, a distant oak, bare of fall’s splendor, offered a brief respite. Resistance proved futile, and after a flurry of haphazard dressing for November’s chill, my moccasins whisked away from the homestead’s warm fire. My being crossed time’s threshold before the bottom of the first big hill, plunging my alter ego into the Year of our Lord, 1796. The sojourn’s pace slowed partway up the next rise. 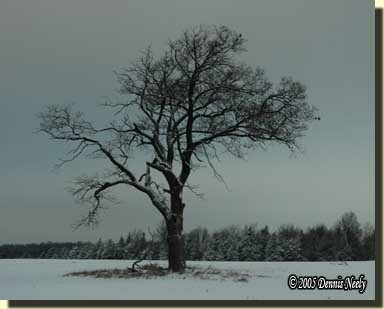 The goal was the old section oak that stood guard over the corn stubble. The closer I came to the hill’s crest, the more I crouched forward, until the hill’s curve forced me to pause and place a knee in the sparse, dust-encrusted snow. To the north, six or eight antlerless whitetails of varying ages meandered about the meadow’s southwest corner. Half crawling, half waddling, my course turned due west until the prairie grass that encircled the monarch’s broad trunk blocked the deer from view. I hastened to the section oak, holding the Northwest gun tight across my chest, watching the meadow and the adjacent cedar grove. Kneeling at the tree’s base, I slipped the portage collar from my shoulders and placed the blanket roll between two roots spaced about the same as a fine Windsor chair’s arms. The smaller of the two seven-point bucks that crossed this field each night walked around the tip of the gully at the meadow’s west side, the gully I so dearly love to hide in when calling wild turkey toms. To my delight, the gentle breeze began shifting to the northeast as I watched the young buck paw for lost cobs. With a twitch of his tail, the buck jerked his head up and began plodding toward the browsing does. Two fast puffs of steam blew from the largest doe’s nose. The buck stopped; the pair stared, not friendly, rather cold and icy. Two more puffs followed, but I could hear no snort. The buck looked down and pawed at the ground like a pensive farmer at an auction, deciding whether to nod ‘yes’ or shake his head. The buck chose the latter and turned away. 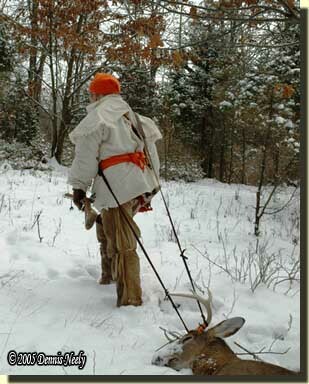 A few steps to the south, the buck glanced back, then made a quick hop and a bound before striking the trail that angled upwind of the section oak. With the tree at my back, I scooched to my left, eased the trade gun around the trunk and adjusted my rump until my left elbow rested firm on my left knee. Quartering right, 80 or so paces out, the seven-pointer stopped, and it was then that I realized nightfall loomed close. It appeared that the buck was waiting for the security of the darkness I dreaded. My back ached and my muscles throbbed by the time the young buck decided it was safe to venture through the old cornfield. At 70 paces, just inside “Old Turkey Feathers’” effective distance, I consider taking a shot. I prayed for a “clean kill or a clean miss,” as I most always do. With the trail passing within 20 paces of my lair, I pondered the situation and chose to wait for a better shot. Out of the corner of my eye I caught the movement of three deer running on the hill two hills to the east. The buck saw them at the same time I did. He stopped walking, and stood stiff-legged, chest on, one of the hardest shots to take and one I had no interest in. The three whitetails hesitated just as the hill rolled into a gentle valley. What looked to be the other seven-pointer pranced not far behind. At that instant I feared the evening hunt was over. The two young bucks cut the older doe from her summer fawns and proceeded to chase her all about the corn stubble. She seemed to have no interest, but never left the field nor ventured too far distant. The frolic reminded me of hunting bobcats and how the older cats toy with the baying hounds, pulling up until the dogs get close enough for a nose-full of hot scent. Well after dark, when the three cavorted off into the cedar grove, I retraced my early evening steps and passed through time’s portal once again. For a traditional black powder hunter, reminiscing about a joyous November evening offers pleasant relief from July’s sweltering heat wave. Rare does a day pass that I don’t wish for a romp in my 18th-century wilderness Paradise. Of late, the sweltering heat of early morning has dissuaded me from that endeavor. A full docket of 21st-century responsibilities doesn’t help matters, either. Now I don’t feel “an intolerable irksomeness” for my responsibilities, and I love my work, but what struck me was the Falcon’s “inclination to spend all my time hunting.” So many days I find myself forced to stifle the woodland wanderlust that burns within my being. I don’t like doing that, but controlling that pesky little angel that sits on my shoulder and whispers “go to the woods” is part of being a responsible adult and family man. 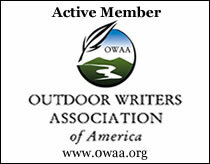 I am just thankful that I can still get afield when time allows—many folks can’t. That November evening hunt was not that long, an hour and a half at most. But in that short time I witnessed many wonderful forest happenings and each helped cleanse my soul of the day’s stresses. In an 18th-century context, that was a workday environment, and when the buck loped off to the east without a chance for a shot that would have been a period-correct stressor. I suppose not feeling the pressure of “a bad day at the wilderness office” is an indication of 21st-century life intruding on the true-to-life hunting scenarios that we all pursue. At any rate, an hour or so just came free tomorrow morning, and rain or shine, I plan to wander through time’s portal and seek my fortune in the Old Northwest Territory. Take an hour and step back in time, be safe and may God bless you. This entry was posted in Deer Hunts, General, Scenarios and tagged Dennis Neely, North West trade gun, Northwest trade gun, traditional black powder hunting, traditional blackpowder, traditional blackpowder hunting. Bookmark the permalink.